I got it in my head this fall that I wanted to cook a pumpkin. I wasn't sure exactly how I wanted to cook it, other than knowing I did not want to make a pie or soup. I let the thought percolate for a couple of weeks to see what might come together. Then Jessica at the knit shop said she used to make pumpkin with pork, and that got me going. But more on that later. This weekend I went down to the green market and bought myself a pumpkin. It was a cute little thing, maybe three times the size of an acorn squash, not too heavy. I did not want to overdo it. I was telling my sister about it over the phone. The seeds came up, and I was about to say how I would probably not go to the trouble to save and roast them when she said "Of course you'll roast the seeds." 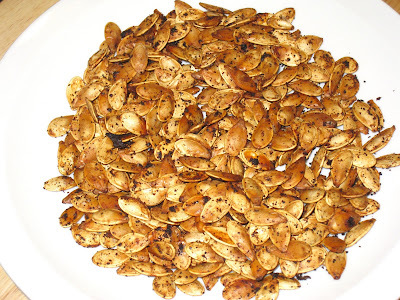 When I still lived at home and my dad would prep the Halloween pumpkin for carving, he would always roast the seeds. My sister and I loved them, and looked forward to Halloween as much for the pepitas as for the candy, I think. Because my pumpkin was so small, I didn't think there would be that many seeds in it. But when I popped it open, I discovered that there were actually quite a few. They were small, but there were enough to make roasting a viable option. So I decided to give it a try. And guess what I got? Roasted pumpkin seeds. And they tasted just as good as I remembered. I don't know how often I will be cooking pumpkins, but I can tell you that whenever I do I will be roasting the seeds. I used this method for seeds from a smaller "pie" pumpkin. You might need to cook the seeds longer with a larger one. Cut the top off of the pumpkin and lift it off. Scoop out the seeds and place them in a shallow dish. Remove as much of the pulp from them as possible and pat dry. Toss with the oil, chili powder, and salt. Place in a single layer on a cookie sheet and roast them for about 40 minutes, stirring occasionally, until golden brown.